When Benjamin Franklin said, “Never confuse motion with action,” he could’ve hardly imagined a 21st Century where the multi-tasking of the modern sales pro puts an eight-armed juggler to shame. Work smarter — not faster. This tool automates the tasks you’re spending hours on each week. 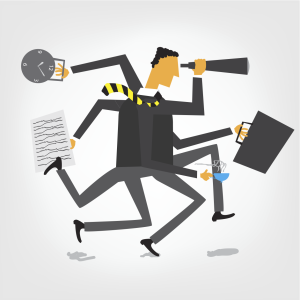 Evidence abounds that salespeople need more time than ever to keep their schedules straight. A new study by the American Psychological Association shows that more than half of employed adults check work messages at least once a day over the weekend (53 percent); before or after work during the week (52 percent); and even when they’re home sick (54 percent). Yet if we’re so tethered to the office, why does it take such heroic effort to get stuff done? That depends on how you define “stuff.” No matter how many times the late Stephen Covey preached it, too many of us fall into that quadrant where the “urgent” (whether it’s important or not) outweighs “non-urgent, important” matters. Guess which quad yields personal, professional and financial growth? Still, that insight doesn’t magically wipe your calendar clean of time-sucking commitments. What’s more, it’s easy to feel overburdened by the sheer amount of moving parts you must manage each day, many of which don’t pertain to selling: managing client relationships, finding resources, attending meetings. That’s why we tapped our own knowledge base and sales leaders to identify five strategies to get you focused on what matters. Just like other white-collar workers, sales people can get geeked out over office widgets and gadgets. That’s not what we’re talking about here. This involves using key apps, programs and methods to help you perform more efficiently. Badger’s mapping tool, for example, helps salespeople organize and prioritize appointments by travel time and routing on a smartphone or iPad. Another app, OmniFoucs, allows you to perform layered scheduling and prioritizing, with a function that turns emails into action items instantly. And for Apple users who haven’t tried iCal on your Mac, consider that as well. It syncs via iCloud with your iPhone seamlessly, sending alerts whether you’re on you laptop or on the go. The wisdom of “managing your managers” has nothing to do with outsmarting your boss. Rather, it’s about utilizing them to get the key resources you need to excel, says Dana Manciagli, former General Manager of Sales for Microsoft and the author of Cut the Crap, Get a Job. “Sales Managers should have a recurring one-on-one time with each rep so it’s on their calendar and the rep can plan for it. And naturally, the reps should have access to the manager outside of that time if they have questions or need help.” High-priority items should include pipeline review, time management cponcerns, or anything you require for support, Manciagli says. “Once you’ve identified commonalities between your clients, go after only those prospects that fit into your sweet spot,” says Brian Sullivan, vice president of global accounts with Sandler Training, a leading sales training organization. “Start profiling clients by asking questions like: What are the vertical trends of your customer base? Where are your customers located? Do your customers fall in the small, medium or large categories? Once you connect the dots and find the commonalities, you’ll find where the greatest opportunity exists.” It’s all about identifying what Sullivan calls the “sticky business parameters”—that is, clues within your current account base that will point where you can best invest your time and effort.